This issue’s cover photo was provided by a proud dad. Todd Wagner of Bucksport Sporting Goods snapped this shot of his son, Adam, with a great black rockfish at Cape Mendocino. This is the kind of fish we all love to fillet. The bottom fishing around Cape Mendocino has been as good as it gets and the deeper depth allowance of 30 fathoms (180 feet) has relieved pressure on black rockfish while providing anglers with access to a variety of rockfish species and new locations to explore. The only two restraining species are yelloweye rockfish and cow cod (southern California). Canary rockfish have rebuilt their stocks and we can keep one per day. The recovery occurred much faster than originally estimated and yelloweye stocks are also ahead of schedule. It is still extremely important to have deep water release devices on your boat to send fish suffering from barotrauma back to a depth where the effects of barotrauma will be reversed. Although they are not yet required, having them on your boat for the CRFS folks to see (page 12) will reduce the mortality rate for released fish. At the last Harbor Safety Committee (HSC) meeting it was reported that many recreational boaters were not slowing down enough in the no wake zone. The Eureka Channel along the City’s waterfront is a no wake zone, please see the map on the next page. Also during the HSC meeting, the Crescent City Harbor District announced that they will begin installing security gates on their docks. Fishing from the docks is not allowed. The move was due to chronic thefts in the commercial fleet and garbage left behind by recreational fishermen. So next February, when the herring run, you will have to take a boat. Dredging is scheduled to occur at the Eureka boat launch and marina by the time you read this. It seems details around this project change on a daily basis. As of this writing, dredging will begin Sept 6th to remove 60,000 cubic yards of material from the Eureka Boat Basin and launch ramp. Disposal will be by barge at the Humboldt Open Ocean Disposal Site (HOODS). Material will be removed by a clamshell dredge and loaded onto a barge. The bid to remove 2,000 cubic yards by this method from the Coast Guard docks came in at one million dollars. All work must be completed by October 15th. Woodley Island Marina is scheduled for next year. Once they get past the initial large volume of material, the Harbor District suction dredge can be used to pump the material to smaller capacity upland sites at a much cheaper rate. The Harbor District sent a Request for Proposals for the “Preparation of Programmatic Environmental Impact Report for Implementation of Coordinated Regional Sediment Management Plan for The Eureka Littoral Cell.” This is the CEQA requirements for “locally managed dredging activities, pumping of dredged materials directly to some reuse sites, the development of sites for dewatering and stockpiling, and may also cover the placement of materials for habitat restoration, sea level rise adaptation, or other beneficial uses.” Proposals are due Sept 15th. This will not address the sediment problem at the entrance to the Bay or the dredging managed by the Corps of Engineers. It has been an epic year for albacore tuna and we are only half way through the season. If the winds and water cooperate this fall, we could see some huge catches of big fish. Our last trip on Reef Madness, with Gene and Margaret Morris, was 35 miles out of Eureka and we boated 15 small to medium fish. The weather started a bit rough but the seas got better as the day passed. We found ourselves fishing in a fleet of 8-10 boats. It looked more like salmon season than tuna fishing. We could even see schools of tuna pass under our hooked fish. 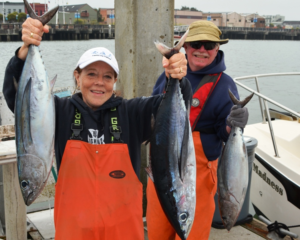 Eureka, Shelter Cove, and Ft Bragg have been busy with tuna trips this year. A few weeks ago, Humboldt Bay was bustling with boats coming in from tuna fishing, more boats preparing to leave, the Thursday Summer Concert with its fleet of kayaks, the entire Humboldt Rowing Club and support boats, and a couple of sailboats. It is great to see the bay that busy and everyone being courteous on the water.